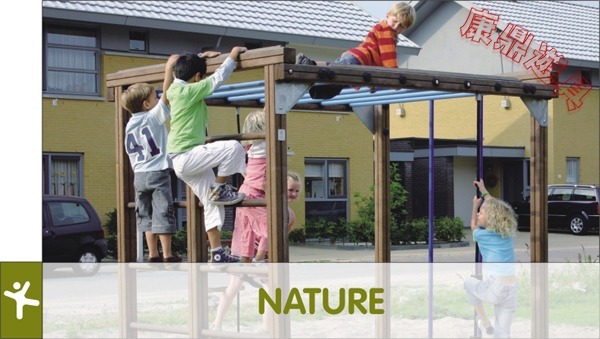 KOMPAN NATURE playground equipment is specifically designed with nature in mind. The use of natural wooden materials and the seemingly simple design give NATURE its unique character, along with a somewhat robust appearance. NATURE is therefore ideal for play areas situated in natural surroundings, and children love to overcome the physical challenges that NATURE provides. The certified FSC hardwood used for NATURE is of an exceptional quality which easily lasts a lifetime. NATURE play equipment can withstand the effects of rain and wind with very little maintenance. Furthermore this hardwood does not splinter and is stronger than a lot of other types of timber. This makes the wooden equipment more suitable for use in any playground. Based on our sense of responsibility and care for the environment, KOMPAN NATURE is made from 100% FSC certified timber, approved by the Forest Stewardship Council. The timber comes from forests that are independently classified as being properly managed in accordance with strict environmental, social and economic standards.